Today Novelties Direct send congratulations to the Beckhams on the arrival of their baby girl Harper Seven and we are wondering if the Beckham Boys have put up Baby Decorations to welcome home their sister. Please also let us know if you have been named or would name a baby after your favourite screen character. Congratulations to Victoria and David Beckham on the arrival of their baby girl Harper Seven. 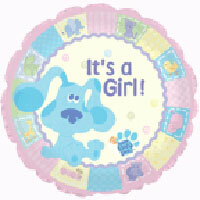 I am sure that the happy couple have been inundated with lots of New Baby Printed Balloons as well as Plain Pink Balloons . Maybe The Brooklyn Boys have even decorated their home with a Decoration Flying Stork and a Baby Buggy Garland to welcome home their new baby sister. What do you think? There has also been a lot of speculation as to where the name Harper is from and it has been reported today that it is the name of Brooklyn, Romeo and Cruz's favourite Disney television programme. Have you been named after a favourite character? Would you name your children after a favourite T.V or film character?